Here’s a great little tool for setting the angle on most everything. The best part is the precision and speed in which you can do it. There are magnets on the bottom which allows you to stick it to anything steel. 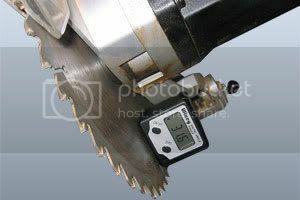 I will use a table saw for example here, but you can apply the same to all tools. 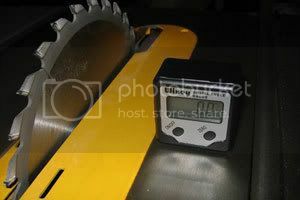 For setting the blade angle on your table saw stick it to your table next to your blade..
Then press the ‘zero’ button. changing it without hesitation. I used to hate changing it since it involved getting a square or protractor. With the magnets you can also store it close. Just stick it somewhere convient on your table saw. The best part is that’s only $39.95. I have even seen it on sale at Rockler for $29.95. yes very handy tool ,ive had one a year or so and love it . Got one of these for Christmas, I will be giving it a try here shortly….. 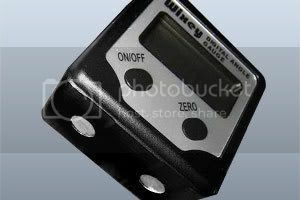 I have never been as confident with my angles as I can now be using the Wixey guage. All the mechanical devices leave you wondering about that last 1° +_. Wixey lets you trim to dead on. I know another decimal place would be kool but it’s not too practical with woodworking. Yeah, it’s a handy item. I use the Beal Tilt Box, but it’s the same thing with an extra decimal place. They are really handy to have around for sure. Thanks for the writeup, Gary. Got one. Love it. I use it on my drill press as well. I have the “Dixie” – which is Peachtree’s version of this – and it’s incredibly handy. The Dixie has an additional feature, which is a “Hold” button. It will hold the last measurement so you can pick up the gauge and see the angle. 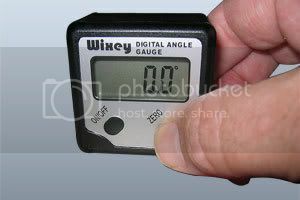 Handy if you’re not flexible enough to always be able to see the gauge when it’s attached to the tool, or when the lighting of the tool isn’t right for use of the gauge. Or, as was the case when I was using it to point my DirecTV satellite dish, when my ladder wasn’t long enough to let me see the gauge when it was on the post – I just stuck it on the post above my head, let it measure, then hit the Hold button and brought the gauge back down to where I could see it. I might as well add a review, I guess! I have the Wixey and love it. I also highly recommend it. Bruce, on the Drill Press why didn’t I think of that! I was just trying to square up the bit to the base, and was having a hell of time. I’ll have to check it the next time I’m in the shop to see how close I got. Thanks for the review. I have one and it’s very handy. But hadn’t used it on the drill press. Great information. I wasn’t familiar with these devices. Gary you are correct – it is a very valuable addition to anyone’s shop. I also have the Wixey Digital Planer Readout as well as the Wixey Height Gauge – I have not used the Height Gauge yet, but the Planer Gauge is dead on – if you want to plane a board to .750 – it will indicated exactly when you get to that thickness. I will review the Height Gauge once I play with it some. I’ve got one and I LOVE it! Bill – I have the planer readout also. I was going to post a review but they just upgraded the design.